Outside the production itself, the Australian Broadcasting Company (or the ABC for short), which is still the current primary channel for Doctor Who airing in Australia, was one of the first and longest term purchasers of the series from the BBC from its beginning, initially planning to screen the series in May 1964, within months of the UK premiere. The ABC later put up production money for an anniversary special The Five Doctors. Although a Doctor Who story has never been filmed in Australia, there have been many references to the great land down under! From the Fourth Doctor meeting Aussie opera singer Dame Nellie Melba, to the Second Doctor briefly visiting before being captured on the shores of an Australian beach in The Enemy of the World, to even Amy Pond suggesting the Australian Outback as a possible place for the Silurians to live in Cold Blood Australia is no stranger to being mentioned in Doctor Who scripts! Who knows maybe an Australian adventure may be on the cards for Series 8!!! (See what I did there Who knows) Classic Australian humour. Whovian Culture Although we are no Great Britain when it comes to Doctor Who, Australia still knows how to celebrate the 50th Anniversary in style! How exactly are we bringing Who into the spotlight? Well. 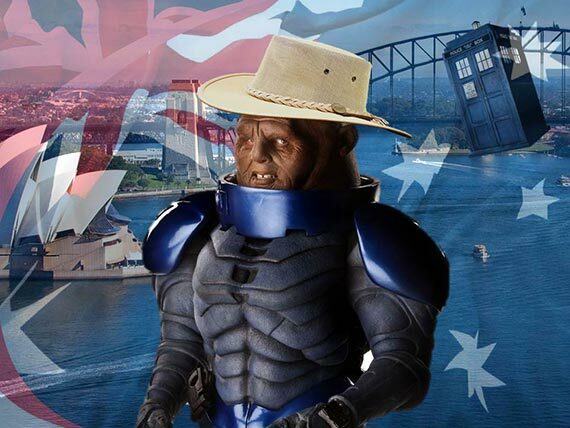 Cinema Screenings: Australia has become theguinea pig testing farm for Doctor Who episode screenings on the big screen. On two separate occasions, theyve had special events that have sold out in cinemas all over Australia with the first event showing The Impossible Astronaut and Day of the Moon in one epic evening, and more recently Asylum of the Daleks and The Angels Take Manhattan being screened a few weeks later.